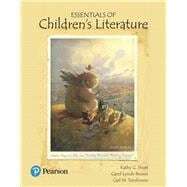 by Short, Kathy G.; Lynch-Brown, Carol M.; Tomlinson, Carl M.
For survey courses in children’s literature. Also suitable as a companion text in an integrated reading/language arts course. From a well-known, well-respected author team–a comprehensive, yet concise resource about children's literature and engaging children as readers. This widely popular text focuses on engaging pre-service teachers and librarians in experiencing the joy of reading, selecting, and sharing excellent children's books with students and engaging them as readers. Clear, concise, and direct, the book uses recommended book lists, examples, figures, and tables in combination with narrative and prose, freeing class time for involvement with literature. Through newly added connections to classrooms and libraries, in addition to expanded content related to standards and trends in literacy, Essentials of Children's Literature is an indispensable guide for future teachers and librarians. Kathy G. Short teaches graduate courses in children’s literature, inquiry, and curriculum at the University of Arizona and taught elementary school in Indiana and Ohio. Her books include Teaching Globally: Reading the World through Literature, Critical Content Analysis of Children’s and Young Adult Literature, Creating Classrooms for Authors and Inquirers, and Stories Matter: The Complexity of Cultural Authenticity. She is director of Worlds of Words (www.wowlit.org), an initiative to build bridges across global cultures through literature. She has served on numerous book award committees, including the Caldecott, and is the Past President of NCTE. Carol Lynch-Brown taught graduate and undergraduate courses in children’s and young adult literature, reading, and language arts education at Florida State University. She was a teacher in elementary school and middle school in St. Paul and Minneapolis Public Schools, and taught English in French Public Schools. She co-authored with Carl M. Tomlinson Essentials of Young Adult Literature, 2nd Edition, published by Pearson in 2010 and is a former editor of The Reading Teacher, a journal of the International Reading Association. Carl M. Tomlinson taught graduate and undergraduate courses in children's literature and language arts at Northern Illinois University. He was an elementary and middle school teacher in Thomasville, Georgia, public schools, and taught classes in English in Norway. He co-authored with Carol Lynch-Brown Essentials of Young Adult Literature, 2nd Edition, published by Pearson in 2010, and is the editor of Children's Books from Other Countries, published by USBBY and Scarecrow Press in 1998. So Why Is the Reading of Literature at Risk in Our Society?